"And Rashford has won it!" You just never write Manchester United off. It was the stuff of dreams for the Red Devils at the Parc des Princes. 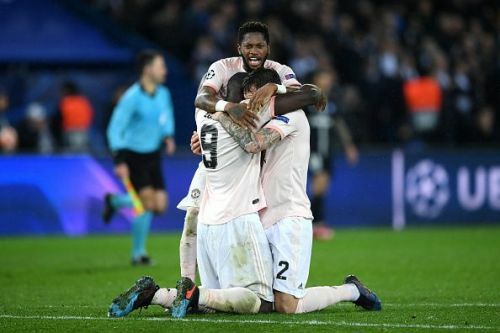 A night after Ajax eliminated the defending champions, Manchester United scripted one of the greatest comebacks in Champions League history. Having lost the first leg 0-2 at Old Trafford, Manchester United required to net the ball a minimum of three times to go through to the round of 8. It was unimaginable for a team to come back from a 0-2 deficit at home in the Champions League, and it required a miracle to turn this around. Without 10 men, United were well and truly the underdogs. Let's have a quick look at how things unfolded in the second leg of the United vs PSG Round of 16 tie. It was the perfect start for United as Romelu Lukaku scored a goal in the second minute of the game. Lukaku took advantage of a Thilo Kehrer mistake and rounded Gianluigi Buffon to send it back in the net. United looked flat after netting one in, with PSG pressing hard at them for the first 25 minutes. A goal always looked on the cards for the France champions, with them dominating possession (85:15) and regularly playing the ball in the United box. Finally, Kylian Mbappe found space inside the channel to fire it to Juan Bernat, who did the rest. Eric Bailly was nowhere to be found and United seemed all but out. PSG kept pressing and kept creating chances with Angel Di Maria and Mbappe teaming up in search for the second goal. Ole Gunnar Solskjaer was quick to take off Bailly, who looked out of sorts, and bring in Diogo Dalot - which proved to be the game changer in the end. Against the run of play, Buffon failed to hold on to a Marcus Rashford kick from a distance, and Lukaku took advantage of the fumble to fire the ball in for his second of the night. United never really got going in the second half. They kept losing possession and some vital balls on the counter attack. In the 83rd minute, Mbappe got a through ball and was one on one against United's goal-keeper David de Gea, but a challenge from Smalling saved the night for the visitors. With about 3 minutes added as stoppage time, United, in pursuit of a goal, pressed forward for the last attack of the night. Dalot tried to put the ball in PSG's box only to hit Presnel Kimpembe on the arm, and the ball went out for a corner. VAR came into the picture and the referee overturned his decision to award United a penalty in stoppage time. And Rashford held his nerve to net it in, completing one of the most famous comebacks in recent times. With this win, Manchester United become the first team to come back from 0-2 down to score 3 times in an away game in the Champions League. Under Solskjaer, United have now defeated the Spurs, Arsenal, Chelsea and PSG (all away). The Ole juggernaut rolls on as the Norwegian is now set to be awarded a permanent job at Old Trafford.